35 concerts. 17,000 motorcycle miles. Three months. One lifetime. In May 2015, the veteran Canadian rock trio Rush embarked on their 40th anniversary tour, R40. For the band and their fans, R40 was a celebration and, perhaps, a farewell. 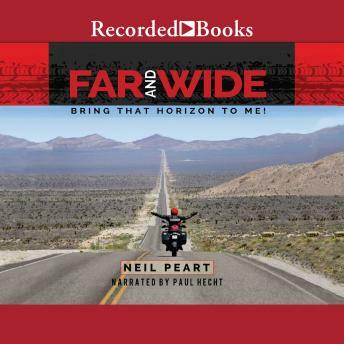 But for Neil Peart, each tour is more than just a string of concerts, it's an opportunity to explore backroads near and far on his BMW motorcycle. So if this was to be the last tour and the last great adventure, he decided it would have to be the best one, onstage and off. This third volume in Peart's illustrated travel series shares all-new tales that transport the reader across North America and through memories of 50 years of playing drums. From the scenic grandeur of the American West to a peaceful lake in Quebec's Laurentian Mountains to the mean streets of Midtown Los Angeles, each story is shared in an intimate narrative voice that has won the hearts of many readers. Richly illustrated, thoughtful, and ever-engaging, Far and Wide is an elegant scrapbook of people and places, music and laughter, from a fascinating road - and a remarkable life.